Creating the perfect outdoor bar is made easier with granite countertops! The air is warming up and afternoons and evenings are being spent on the porch instead of curled up by the living room fireplace. If you love entertaining outdoors and enjoying your landscaping to the fullest, a backyard bar with granite countertops would be perfect for your home. Backyard bars are a fun way to bring the party outside and entertain even more guests at a time. How can you create a backyard bar with granite countertops in time for this summer? Since this backyard bar will be your chance to showcase your excellent taste in granite countertops and contractors (Rock Tops Fabrication), start by choosing the perfect type of granite countertop for you. Granite countertops are perfect for backyard bars since they won’t be chipped by heavy steins of beer or clumsy bar guests. Serving food and drinks directly on top of it is also totally fine, as granite countertops are not stained by oils, sauces, juices, or just about anything. Sealed granite countertops are very easily to clean and totally nonporous. 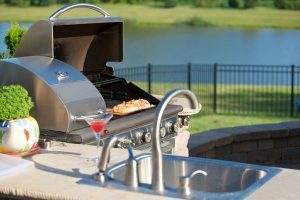 When choosing the granite countertop for your backyard bar, you can select a traditional long rectangular piece or experiment with a curved or ovular top to fit more people at the bar. Depending on your plans for your backyard bar, choose the appropriate shape and size of granite countertop. How Much Do You Need at Your Bar? If you’ll be building your granite countertop and bar against a wall outside, it might be a great idea to add a sink and granite backsplash to complete the look. A granite countertop and granite backsplash will let you prepare food and drinks while still spending time with your guests. Since granite countertops are virtually nonporous, you won’t need to worry about bacteria sticking around on the surface or scratching the countertop with your lime-cutting knife. This entry was posted on Friday, April 21st, 2017 at 11:39 am. Both comments and pings are currently closed.